Who cares about all of that right, now? I could cover 20 pages on positives and negatives of this season but we’re here to celebrate the win of Alfred E. Neuman and Howdy Doody’s love child, Scotty McCreery. What, me worry? I know many of you are cussing, kicking, bemoaning the “obvious” winner, or are so apathetic you’re surprised to find yourselves reading this right now. And let me tell you, if I hadn’t covered this entire season from the get-go I’d be right there with you, on all fronts. Except…I did watch it all and my memory is long, except for all the crap I forgot. Scotty auditioned in Milwaukee and the response to him was immediate; YouTube views and downloads of his audition and pre-Idol performances soared. JLo discovered her inner country groupie and the world collectively fell in love with a freckle-faced, (then) 16-year old boy from Garner, North Carolina. Scotty seemed like a well-oiled, baritone shoo-in except there were missteps, major ones that could have easily derailed the Scotty train. I’ll remind you again of “nuts of wonder” and also “Jacee Badeaux-gate 2011” which both happened in Hollywood Week and had he not taken the judges collective breath away with that initial audition they may not have given him a pass on forgetting lyrics on the biggest country song from 2000. Scotty wins and America got it right for the first time in at least four seasons, which might be reflected in the surge in viewership and Scotty's winning single storming to #1 at iTunes. I forgive those abominations when I see James Durbin onstage with one of his metal idols: Rob Halford and Judas Priest. They perform two songs I’d pay good many to watch that concert, it was wonderful. He was sorely missed at last night’s performance show and seeing this solidifies my belief he should have been in finals buthe’s staying true to his metal roots and this is what James should always sing. Jacob Lusk sings “I Smile” with Gospel legend Kirk Franklin and Gladys Knight (minus her Pips) joins at the end and like James’ performance did- seeing Jacob on stage with these heavy hitters and absolutely holding his own made me realize this is exactly the type of music he should have always been singing and Idol needs to do away with themes once and for all. The six eliminated ladies perform a medley of Beyonce hits, then Queen B comes out and promptly turns them into background singers and dancers and shows them how it’s really done. Ryan introduces a package that portrays Steven Tyler (accurately) as the season’s “Loose Cannon” showing some of his more colorful moments and quotes, reminding us why we had so much fun with him back before we were expecting him to actually judge these people. Haley Reinhart gets to perform with Tony Bennett and apparently she’s jazzy again, they duet on “Steppin’ Out With My Baby” and I actually missed her a tad. She was flirty, not sultry, and playful with the Jazz as if performing with her grandpa at a wedding. The third and final “funny judges package” is a JLo montage reminding us why we love “the most beautiful girl in the world” and showing the various come ons and general foolery that went on whenever someone met JLo for the first time. Lil John, TLC, and the eliminated ladies perform the most awkward medley of songs that it gets my “out of left field” award. I mean, why are they here and why is Lil John performing as the new “L”? Scotty McCreery performs with Tim McGraw and they do “Live Like You Were Dying” which was great, and fun to watch. He absolutely held his own with arguably the biggest male star in country music, consistently for the last decade. Kudos to Tim for sharing the stage with the new kid, many artists would never consider such a thing. Mr. Jennifer Lopez (Marc Anthony) performs a song in Spanish with Sheila E. on drums which was okay but boring, then JLo comes out and dances for her husband- shaking it in such a way, my 10-year old son will never be the same. Now the top guys perform a Tom Jones medley… Paul! I almost forgot about you! James! I will never forget you! I think! This cast seems to genuinely love each other, the male contestant’s interactions are just downright adorable, and they’re very obviously fond of each other and comfortable around each other. In contrast to the ladies who seem more awkward and stiff with each other. Suddenly Tom Jones appears, walking out singing “It’s Not Unusual” and the cast starts doing the Carlton dance. Another mentor from the season performs tonight- Lady Gaga sings her single “The Edge Of Glory” which is slightly inappropriate, weird, and repetitive. Yes, I know; she was born this way. When it was over, JLo almost knocked herself over clapping so hard. Back from commercial and Lauren Alaina struts out singing “Before He Cheats” and her very own idol, Carrie Underwood, came out to perform it as a duet with her. It was funny, cute, entertaining and Lauren did a great job swapping lyrics with her idol. However, she was definitely overshadowed by the superstar (whereas Scotty totally held his own with Tim McGraw) but, Lauren did well… for her. Beyonce came back out and performed her new single, “One Plus One” and once again I’m confused because didn’t she debut a new single a week or two ago? What’s going on around here? Bono and The Edge assist on a song from the Spiderman musical. They were on a ridiculous, webby set, the kid singing was wearing a red, webby jacket, and Bono looks so old tonight. Spiderman is flying around in the aisle, hooked up to cables. Who just jumped the shark, here? I think we all did. Steven Tyler comes out doing “Dream On” starting on a white piano, finishing standing and wielding his scarf-adorned mic stand. I fell in love with him for the 100th time as we were reminded of who he is, why he should be revered, and why we put up with his nutty Steven-isms. Wen Ryan asks how it feels to have just been crowned the newest American Idol, Soctty answers “Me and Lauren have been together a year and will stay together.” Okay, um, what?! Scotty sings his first single “I Love You This Big” and it’s a big of a mess as coronation songs always are. He marched down the stairs to his parents and hugged them, cried and laughed into the mic, went on to hug the entire front row including who I think was Billy Gibbons from ZZ Top, leaving Jack Black hanging for his hug. He hurries back up the stairrs and hugs his old competition; all 12 of them. He tells Lauren Alaina, “I love you, baby” I think, or I’m sure. I have no idea, this became Bizzaro Idol as soon as I saw Bono performing in swirls of fog or dry ice, or whatever it was that reminded me of Friday nights at the skating rink. 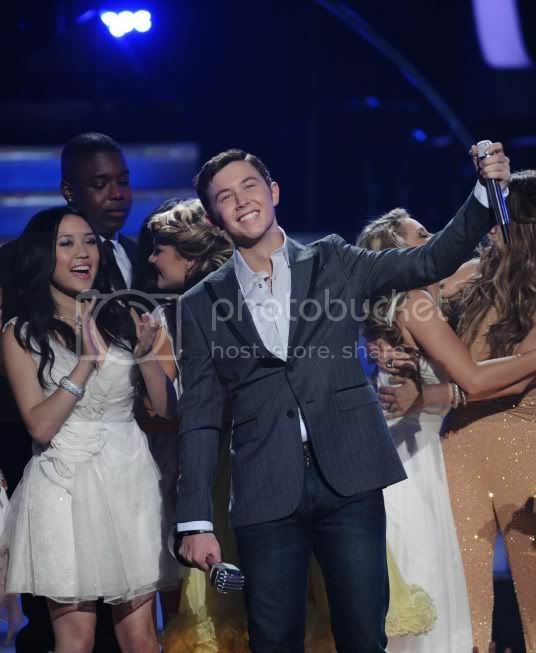 Once Scotty finishes singing/butchering his first single he collapses to the ground, surrounded by his friends and fellow contestants and cries while sticking out his tongue to catch the confetti like it was snowflakes. What a magical, childlike moment that I sincerely hopes lasts for him. You might not agree with the final two or even the winner but of the two we were left with Scotty was undeniably America’s choice since January. What did you think? Right winner? Did you watch? How did this season’s finale stack up to finales of the past seasons? Scotty and Lauren’s first singles are available now on iTunes and I'll review them both.